I did something for this post that I have never done in the history of Macheesmo. I used a store-bought pizza crust for this Asparagus Pizza. When asparagus dominated the poll last week I struggled for a while on what to do with it. When I finally decided that I wanted to make the best pizza you’ll ever eat, I didn’t have enough time to make my own dough. As an aside, store-bought crusts are kind of highway robbery. This one cost me $4 and I threw up a little in my mouth. 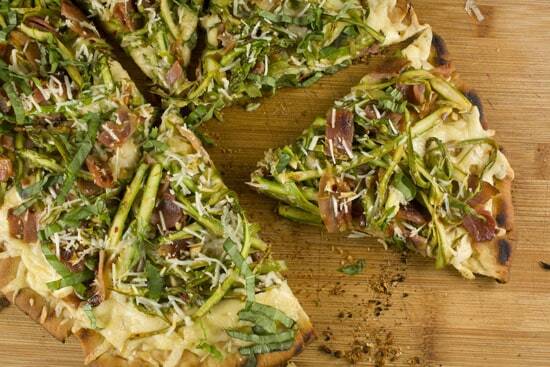 So, if you have time, I’m always an advocate of homemade pizza dough which all of my other pizzas use, but even if you don’t want to make your own dough, don’t let it stop you from making this Asparagus Pizza immediately. This is a fantastic way to cook spring asparagus. 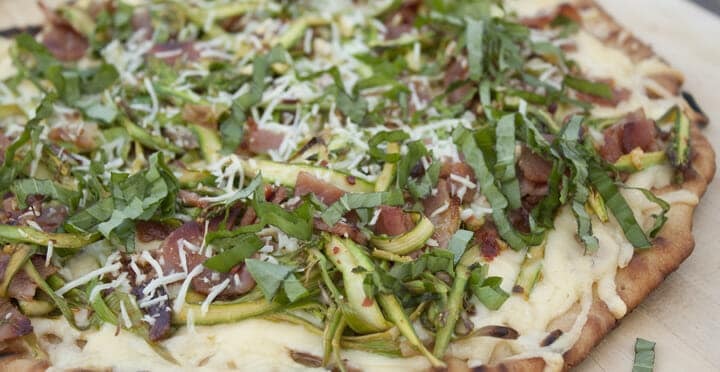 Topped high on a pizza with pancetta, lemon, and cheese and then grilled to perfection! 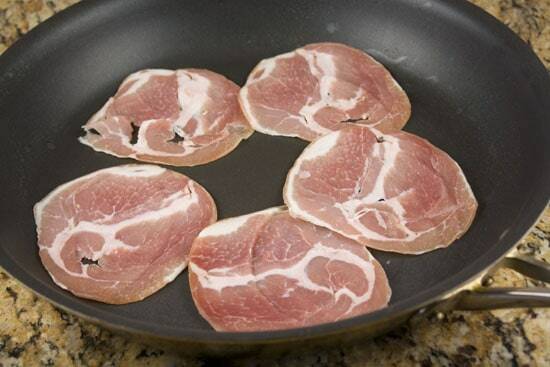 1) Lay out pancetta in a skillet over medium heat and cook, flipping occasionally, until it is very crispy – about 10 minutes. Then let cool and dice. 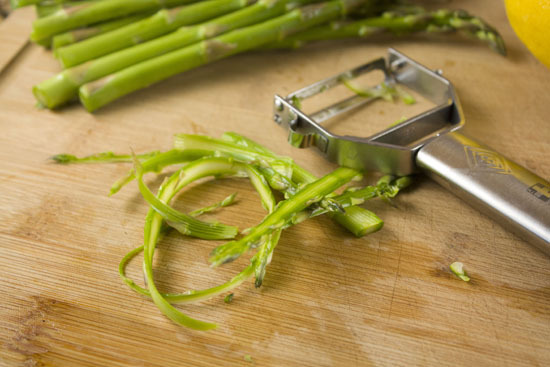 2) Use a good vegetable peeler to slice asparagus into slivers. 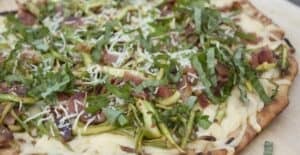 3) In a bowl, mix asparagus slices with lemon zest and juice, garlic, red pepper flakes, pancetta, a drizzle of olive oil, and a pinch of salt and pepper. 4) Grate cheese and mince basil and set aside. 5) Heat grill to medium-high heat or heat oven to 500 degrees. If using oven, just drizzle dough with olive oil, then top with cheese and the asparagus topping. Cook for 10-12 minutes until crust is golden brown. 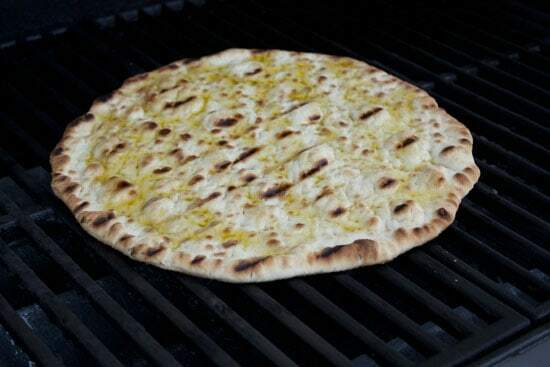 6) For grill, once grates are hot, cook dough for 2 minutes on one side, then flip. Drizzle oil on cooked side and top with all the toppings. Close grill and cook for 8-10 minutes. 7) When pizza comes out, top with fresh basil and serve immediately! 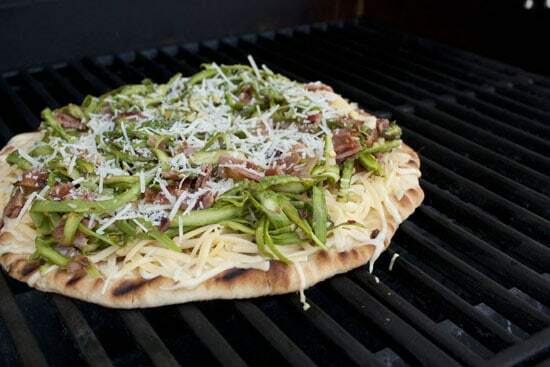 One thing that makes this Asparagus Pizza topping really special is pancetta. You could also use bacon, but basically salty pork products and asparagus taste really delicious together. I picked up some good pancetta and just seared it off in a skillet over medium heat until it was nice and crispy. You could use bacon or prosciutto or just leave this out entirely for a veggie version, but it’s really delicious. 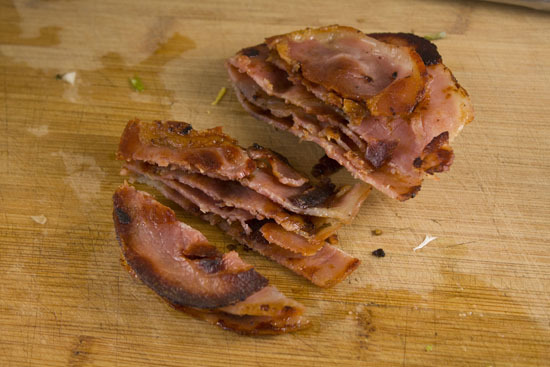 Once it’s nice and crispy, just dice it up! Asparagus spears are a bit thick to just plop on a pizza. They probably wouldn’t cook through all the way and would just be too much. So I decided to make slivers out of the asparagus and use that for a topping. This worked awesomely. Basically you need a good veggie peeler and you just peel the asparagus and keep peeling it until you’re left with slivers! This might look like a lot of work, but you only need to do about 15-20 spears and you can do it while your pancetta cooks. It really doesn’t take that long once you get the hang of it. 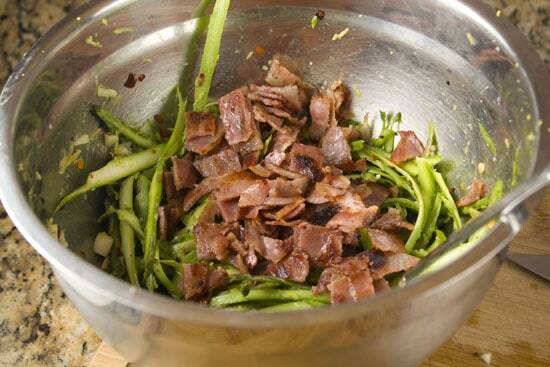 Then just combine the asparagus slivers with the minced garlic, lemon, red pepper flakes, and chopped pancetta. Add a drizzle of olive oil and a pinch of salt and pepper and your pizza topping is ready! Would work as a salad actually. Obviously, you could cook this in the oven, but since it’s really nice outside right now, I decided to grill mine. 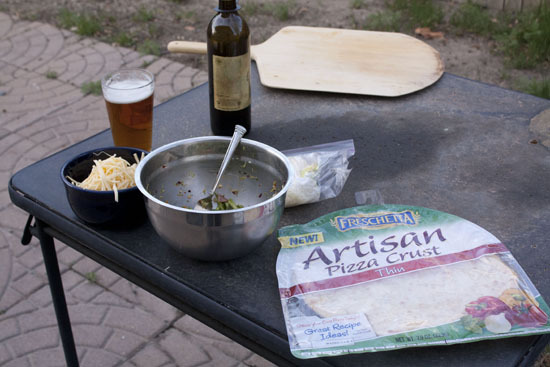 Make sure you have everything ready for the pizza before you throw it on the grill. Grate your cheeses, make the topping, and have some olive oil handy. Also, beer doesn’t hurt. You are grilling after all. Heat your grill to medium-high heat and let the grates get really hot. Toss the dough directly onto the grates and let it cook for about 2 minutes. Then flip it over. NOTE: If you are making your own dough, check out this post where I show you how to grill real pizza dough. When you flip your dough, add a good drizzle of olive oil and now your dough is ready to top! Pile on the gouda cheese (I used the unsmoked version). Then add all the slivered asparagus toppings followed by some Parmesan. Close the lid and let the pizza cook for 8-10 minutes. The crust should get super-crispy and the asparagus should be cooked, but still have a tiny crunch to it. When it comes off the grill, sprinkle on some fresh basil and serve it as soon as possible! This Asparagus Pizza was a really delicious pizza. My favorite part was honestly the lemon. Just a little bit of it makes all the other flavors pop. Whether you make homemade crust or take the lazy route like I did, this is a keeper of a pie! My local mom-and-pop pizza shop will sell a ball of pizza dough (the same amount of dough they use for a large pie) for a dollar. I never make my own dough, anymore. That’s also looks like a small dough for that price. Trader Joe’s sells their dough for $0.99 a pop, and in three flavors – regular, whole wheat, and herbed. I almost always make a homemade sourdough version, but when I can’t, Trader Joes it is! My local grocery store sells fresh pizza dough balls for $1 in the bakery/deli section. They have several selections and are so good we hardly ever make our own dough anymore. Sometimes they also have baked pizza crusts for about $2. I’m going to try this pizza in the next week or two. Love asparagus and pancetta. I saw a similar pizza online recently and am definitely trying yours this weekend. Strangely, my only hang-up is that I think I’d miss the tomato sauce. Do you think a little tomato would work with this? Or pesto? The no sauce thing makes me strangely nervous. Oh yea… a little tomato or pesto would work beautifully. It would be delicious. Store bought crusts can also be highway rubbery too. « Bourbon Cured Salmon Recipes Home » The Internet Kitchen: Obedience!